Feeling overwhelmed by the clutter? JOIN OUR FREE DECLUTTERING CHALLENGE! Hey friends! Today is a fun day! At least I think it’s fun… haha! I recently took a “real-life home tour” on Instagram stories and shared it all there. But since I know not everyone follows me there (but you should! 😉), I thought I would make it into a video and share it here as well! It’s a long one, but it’s full of allllll the behind-the-scenes footage of my home. I tried to go through and note the video time when I share each room below. And I make some notes as well because there are things that I talk about that have already changed in the last month. Also, if you see something that you want to know where it’s from, you can either search it in the search bar at the top of the page, or you can go to my “Shop My Home” page (here) and it should all be linked there. You can always leave a comment below and I’ll try to answer them as well. How my dining room looks on a regular day. What my daughter does to my chalkboard when I step out of the room to use the restroom. An up-close look at my new living room rug! And the never-before-seen Laundry Room! 6:26 – The Gallery Wall in my Living Room – The awesome console table can be found right here! 7:00 – The Dining Room in all its messy glory! Here’s a more recent, prettier view of the dining room. 9:48 – The Eat-in Kitchen. I mentioned that I hadn’t shared about my new bamboo blinds, but I have since I filmed the video! You can check out Everything You Need to Know to Choose the Best Bamboo Shades right here! 11:19 – The Kitchen. If you’re interested in the reclaimed wood treatment on the bar wall, check that out here! And if you’d like to see my open kitchen shelves all decked out for spring, they are right here! 16:10 – The Never-Before-Seen Laundry Room! Click here to see the ironing board hanger tutorial! I hope you enjoyed the tour! Again, if you need to know about any sources, then click on my Shop My Home page. And if you want to know about a tutorial, please use the search bar at the top right of the page. Or feel free to ask me questions in the comments below! 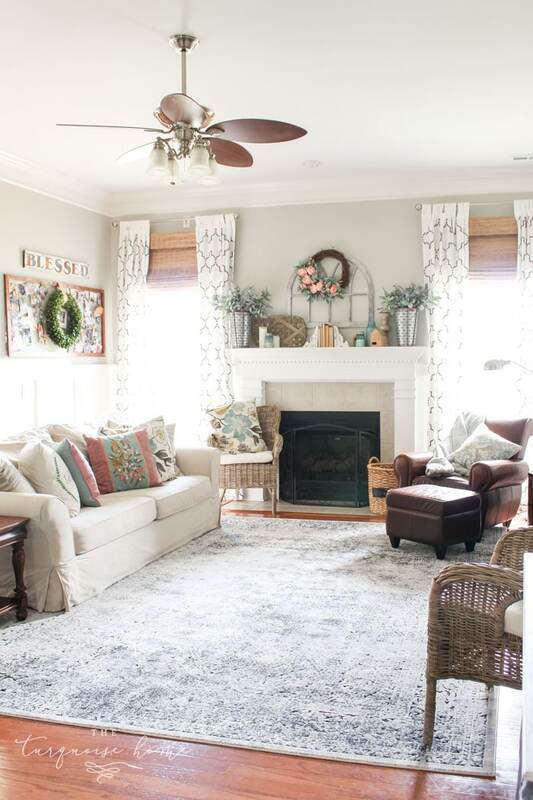 Grab your FREE guide for 10 Ways to Customize Your Home on a Budget: simple projects to transform your home from builder beige to a home with character and charm! I love your decor. ideas. I have a small a space in my bedroom that I use for my as my office area. Some of your storage ideas I will try and use. I love your home tour. So many wonderful finds. Your home is so welcoming, warm and cosey. Thank you so much, Ivory!! You just took home tour to another level with this video! So much more fun than just looking at the photos. Aww, thank you! I’m so glad you enjoyed it! Amazing home tour Laura! Your home is pretty! I can’t get over how clean and nice looking everything is! Thanks for sharing such a post. It is really a brave act of showcasing the behind pictures of the post. And This is why I like your blog, Laura! You’re one earnest blogger I’ve ever seen:) All the best! Loved the home tour. I, too, get envious of the neat, tidy, gorgeous homes that seem always just perfect, so thank you for being real!!! I get a little envious that everyone else’s homes are looking great and mine looks lived in, so I am thankful for your braveness to share the behind the scenes video.